Borrowing a bit of influence from arcade classics like Galaga and Space Invaders, Super Crossfire from Chillingo is an excellent single-screen space shooter that has just enough unique elements to set it apart from those time-tested franchises. The game was obviously designed by folks who not only know their arcade history, but also know how to get the most out of the iPhone gaming experience, as the mechanics fit the platform perfectly. Super Crossfire is perfect for bite-sized gaming portions, and its simple-but-effective control scheme solves the problem of no buttons. 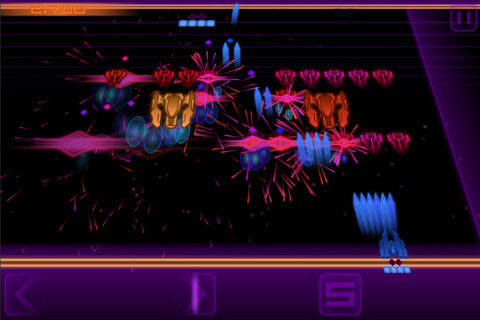 The basic gameplay mechanic of Super Crossfire is very familiar: you guide a ship along the bottom of the screen as a horde of alien enemies shifts back-and-forth above you. 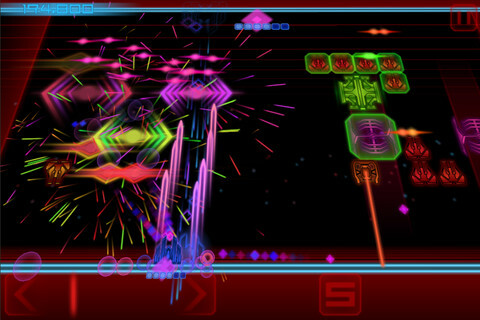 In this game, however, while you guide your ship from left to right with one thumb, simply tapping anywhere on the screen with the other thumb will warp you to the opposite side of the screen. This makes for an interesting strategical advantage as if there are too many bullets coming at you from above, you can quickly flip to the top of the screen. Of course, enemies can shoot above and below, so you’ll always find more bullets waiting for you on the other side. However, oftentimes, warping can momentarily save you from death. Were this the only advance made over the Space Invaders formula, Super Crossfire wouldn’t be much to fuss about. However, you’re also able to earn points throughout the game, which you can use to upgrade your ship. Earn a more powerful bomb, power-up your defenses, purchase a spread-gun, and much, much more. Planning for the next battle is an important aspect of Super Crossfire, and you’ll need to spend your points wisely. 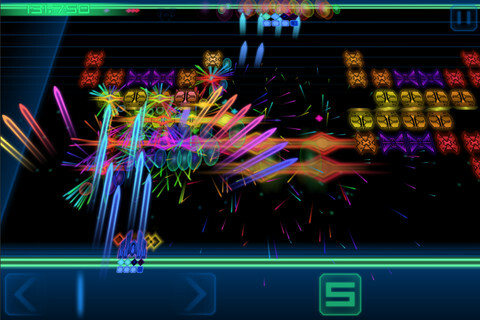 While Super Crossfire has borrowed from Galaga in the gameplay department, it seems to have also borrowed inspiration from the more recent Galaga Legions series in regards to its visuals. 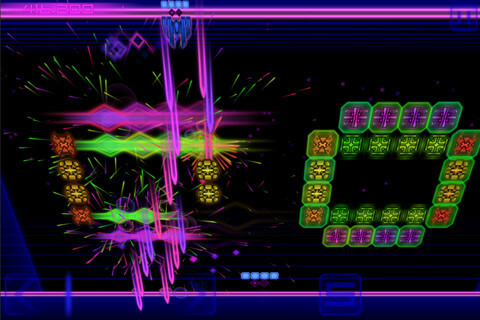 The game is quite flashy with its use of multi-colored neon enemies and bullets, and the result is quite similar to Galaga Legions, Geometry Wars, and other modern arcade-style shooters. It’s a look that serves it well, but is sure to draw comparisons. In the end, it’s hard not to love Super Crossfire. The levels are quick but plentiful, the control scheme is perfect for the iPhone, and despite its simple concept, it forces you to think quickly and strategically. For a buck, this game is a must-buy. Bottom Line: If you’re looking for a classic shoot-em-up with enough modern pizzazz to keep you playing for weeks to come, Super Crossfire ought to sufficiently scratch that itch. 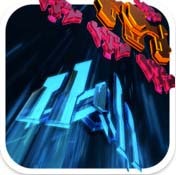 Super Crossfire is compatible with iPhone, iPod touch, and iPad. Requires iOS 3.1.3 or later.